I was a Brooks Ravenna girl for a long time. I started with the Ravenna 4 and rode it out to the Ravenna 6 with no problems. Each iteration may have had some subtle differences, but for the most part they were unremarkable in that they continued to work fine for my feet. Then, a little over a year ago, I was fitted for the Nike Vomero 10. It was a switch from a support shoe to a neutral shoe and that took some getting used to, but after a rocky start we found a groove. I've gone through many pairs of 10s now and thoroughly enjoyed the bouncy ride. Once I've selected a shoe, to save money, I like to stay one model behind. So when the Vomero 12s came out, I knew it was finally time to take a crack at the Vomero 11s. I found a great post-holiday deal and they were mine. I immediately noticed a difference. Not saying which is which so that if I'm making up a difference you can tell me. Look at that heel! It's so thick. Weird! But squeezing it was pleasantly squishy, so I didn't worry about it. Versions are never that far removed from each other, right? A few weeks post-WDW Marathon I decided to take my new shoes for a test drive. Putting them on was oddly difficult - I had to loosen the laces and then readjust them to get my feet in properly. 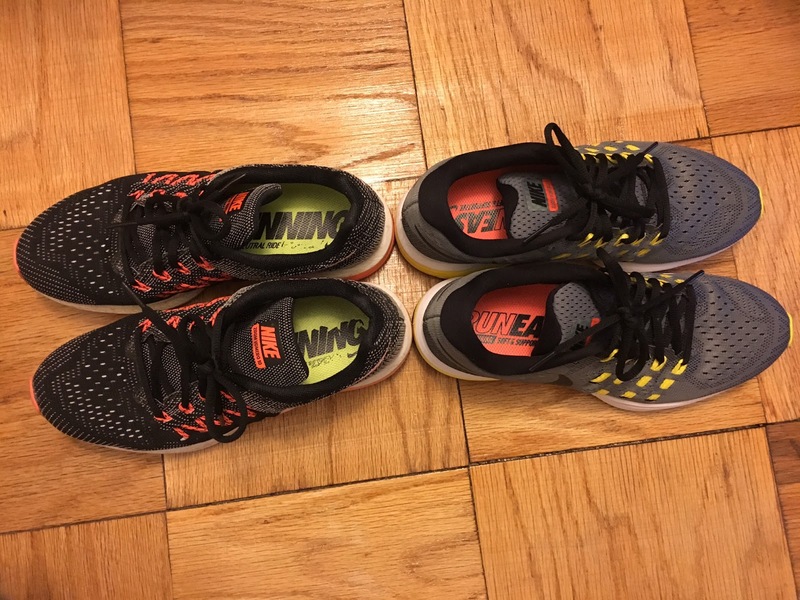 The toe box felt smaller, too, in that I could actually feel it. What drew me to the Vomero 10 in the first place was its incredibly comfortable box, like it was made just for me. I wasn't loving this. I took 'em for a test run just the same. They were okay, as it turned out. But the seam of my left sock rubbed a sore on my big toe, something that has never happened in the 10s. And I just didn't have that Cinderella feeling that the shoe was made for my feet. I've run in them again since then using compression socks instead of regular socks and they worked fine with no rubbing. I got the 11s for a great price and they do work for short runs so I intend to keep them. And who knows, maybe once I get through the break-in period they'll be great. But I've ordered a pair of 10s off eBay for the Rock 'n Roll Marathon in March, because I am NOT taking that chance. For the future, I know Vomero 10s are going to get harder and harder to come by. I probably need to get fitted again. Maybe the Vomero 12s are awesome? Or something else is. I'll stop by Roadrunner Sports sometime this summer and find out. Have you ever been betrayed by a new model of your favorite shoe? How did you cope?